Aaron Simms: I am SPARTACUS...really. My next production will be a new play adapted from the legend of SPARTACUS. 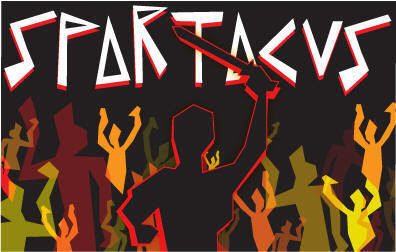 I will be playing Spartacus in this world premiere play at the Inwood Shakespeare Festival. The production runs July 18 through August 4 in New York. Visit moosehallisf.org for production information. Break a leg with opening tomorrow! Kim & I will see you in a couple of weeks! Now go forth and slaughter some Romans. And stuff. All hail Spartacus! Careful wielding that sword. Break a leg! Raise your right hand...right hand.